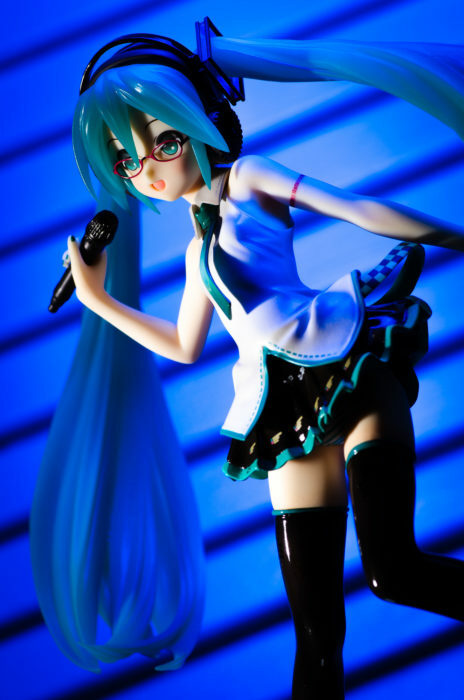 As the least photographed figure in my collection with no reviews written about it, I’ve always meant to take more photos of my LAT Hatsune Miku figure. So I decided to take it out of its glass prison for a spin and see what falls out. It was an indoors shoot with no backdrop setup, but I’ve gotten sick of shooting figure against black and was in the mood for something slightly different. Recently I read a great article about colour theory in landscape photography by Ted Gore. While the landscape aspect is not terribly relevant here, it did get me thinking using complementary colours to spice up these basic indoors shoots. As much as I like my black backgrounds, they really don’t suit the more colourful and cheerful figures in my collection. 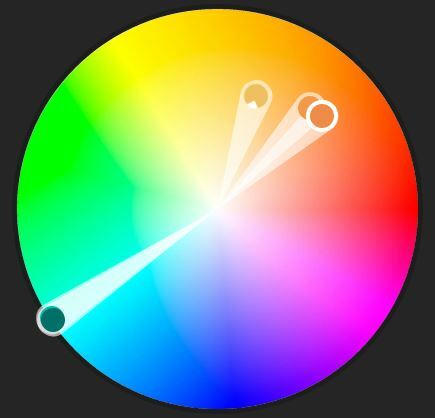 A sampling of the shot’s colours on the colour wheel. A quick Google search revealed that orange is on the opposite side of teal on the colour wheel, meaning they are complementary colours. Besides that, I also feel orange is a good fit for the figure’s energetic mood. 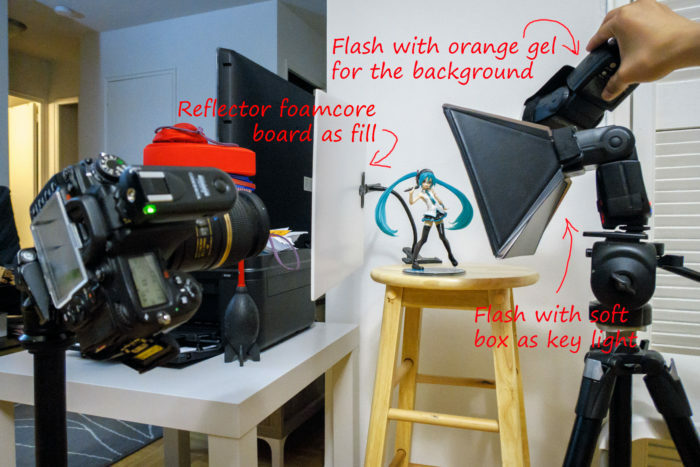 All that’s left to do is sliding a orange colour gel in front of a flash and pointing it towards the wall behind the figure to create the glowing orange background. The second thing I was mindful of was the composition. Since I use a macros lens and have no interesting backdrop to speak of, I naturally gravitate towards a closeup portrait shot to fill the frame. 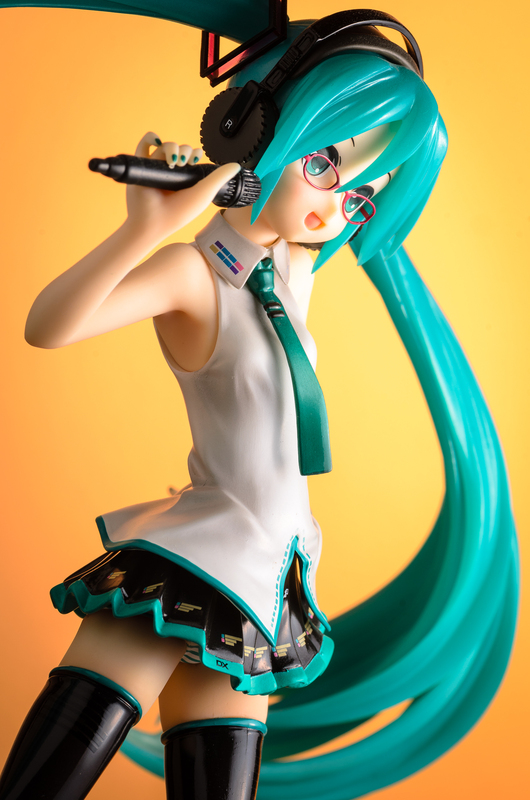 This figure is does not have a lot of good angles. The frontal angle is plain and would crop off most of the hair. 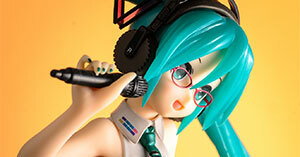 But shooting from the figure’s left hand side results makes the figure’s pose look extremely contorted. 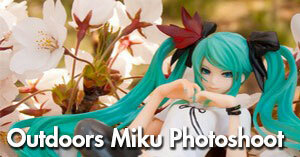 In a shot I did a while back from this angle, Miku looks like a passenger in a small car in the process of being t-boned by a truck. 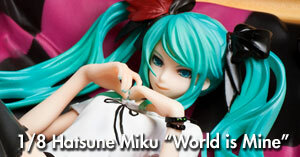 This leaves the angle from the figure’s right hand side, which ends up hiding almost all of the figure’s left arm. 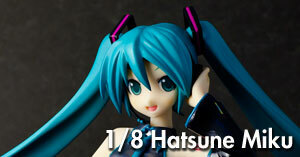 On the bright side, it does show off the attractive curvature of Miku’s left pigtail. With a bit more trial and error with the camera angle, I managed to frame the shot so that the figure’s right leg and both of pigtails create leading lines from the corners of the frame to the figure’s face. All in all, I’m happy with this shot. I doubt it would make anyone’s pantheon of great photos, but it has been a worthwhile thought exercise and application of recent lessons learned, culminating in a small yet welcome step forward.